Black men who commit the same crimes as white men receive federal prison sentences that are, on average, nearly 20 percent longer, according to a new report on sentencing disparities from the United States Sentencing Commission (USSC). These disparities were observed “after controlling for a wide variety of sentencing factors,” including age, education, citizenship, weapon possession and prior criminal history. 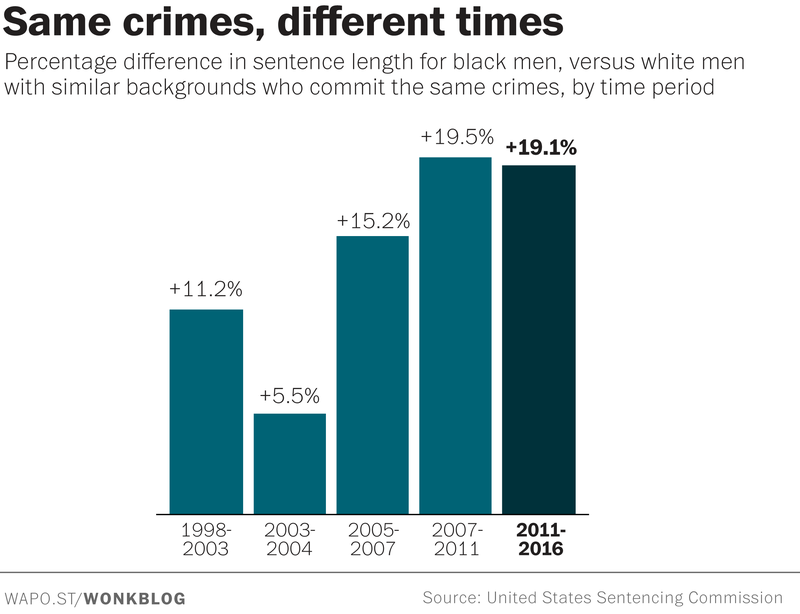 The black/white sentencing disparities have been increasing in recent years, the report found, particularly following the Supreme Court's decision in United States v. Booker in 2005. Booker gave federal judges significantly more discretion on sentencing by making it easier to impose harsher or more lenient sentences than the USSC's sentencing guidelines called for. Before that decision, federal judges were generally required to abide by those sentencing guidelines. According to the Sentencing Commission's report, the black/white sentencing disparities are being driven in large part by “non-government sponsored departures and variances” — in plain English, sentencing choices made by judges at their own discretion. Judges are less likely to voluntarily revise sentences downward for black offenders than for white ones, in other words. And even when judges do reduce black offenders' sentences, they do so by smaller amounts than for white offenders. That finding suggests that giving judges more discretion in sentencing, as the Booker decision did in 2005, allows more racial bias to seep into the process. But Marc Mauer, executive director of the Sentencing Project, a group working to reduce bias in the criminal justice system, says there's more to it than that. He says that decisions by federal prosecutors — whether to seek a charge carrying a mandatory minimum sentence, for instance — are also driving the disparities. The United States currently houses the world's largest prison population, with an incarceration rate of roughly 666 inmates per 100,000 people. Among whites, the rate is 450 inmates per 100,000 people. The incarceration rate for blacks is over five times higher, at 2,306 inmates per 100,000 people. The USSC report indicates that sentencing decisions are a big driver of those numbers. And according to the University of Michigan study, at the federal level alone simply eliminating the sentencing disparity would reduce the number of black men in federal prisons by about 9 percent and save taxpayers at least $230 million a year.